All was quiet in the Solitude region. A silent local channel can make a highsec system--no matter how populated--feel like a very lonely place. Enter the Agents of the New Order. Covetor pilot AroGaZ1 Ellecon lost his ship. It proved to be an excellent conversation starter. Agent Milkmypigeon knows the art of the segue. Why push the Code on a miner if you can get him to ask you about it? AroGaZ1 was too upset to fully grasp what a wonderful opportunity he'd been given. He resorted to name-calling, which, in a calmer mood, I'm sure he'd admit was beneath him. Busybody Gelidusanima Talvanen observed the Agent-miner interaction with growing anxiety. There's nothing a rebel hates more than watching a miner buy a permit. The problem with the carebear ideologues is that they don't have an alternative to the Code--unless you consider non-stop failure to qualify as such. Their snippy attitudes are easily steamrolled by charismatic Agents. Milkmypigeon almost name-dropped the Saviour, but he decided to hold that card in reserve for the time being. You can always tell when a miner's resistance to the Code is softening. Even Gelidusanima could sense what was coming. AroGaZ1 switched to his alt to continue the conversation. Our Agent offered him the Code, but the miner was too lazy to read it. 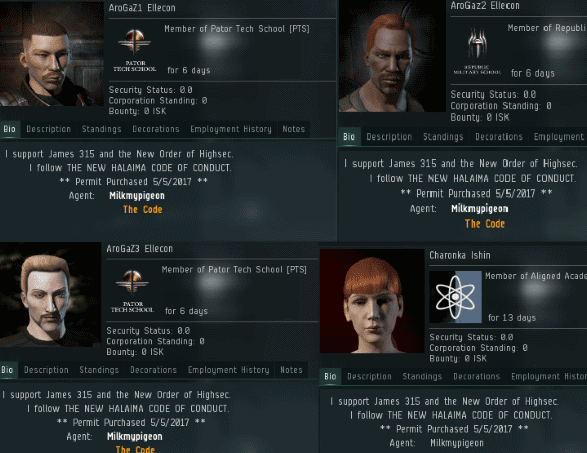 But even a lazy miner can transfer isk. Agent Milkmypigeon cautioned against buying permits without knowing what was in the fine print, but the miner urged him to accept his money. Our Agent graciously sold him eight mining permits. One by one, the permits went up in the mining alts' bios. Milkmypigeon was optimistic; the miner might choose to read the Code later and fully embrace it. In the meantime, he could always revoke the permits if AroGaZ1 violated the Code. That's just good business. Kip Winger is lost content. James 315 is lost content. Impotent rage is the best kind of rage! Nicholas Cage is lost in "Con Air"
McDavid has lost the Con Smythe. A broke camper has lost the tent con. A depleted police force has lost its Constable. The miner that recently calmed down has lost his consternation. A forgetful construction worker has lost concrete. A distracted driver has lost his concentration. A busted drug addict has lost contraband. A humble man has lost condescension. A terrible hot dog vendor has lost his condiments. De-ionized water has lost conductivity. A leaderless orchestra has lost their conductor. A downsizing church has lost its confessional. A distraught investor has lost confidence. An exposed ninja has lost concealment. Defogged window has lost condensation. Lol that kept you busy for a few minutes. In the education system they say "simple mind, repetitive task"
Though I guess you could say that the education system has lost its concept! Well done! Selling a site license permit sure feels good. I set converts to +5 so when I see them in system I can hold them up as examples to the noncompliant miners. Or blow them up and tell em they violated the code, both sound equally nice, but the latter is always better in my book. Lawrence Lawton > So far you have been using completely untanked retrievers. Oh come one now, you know you'll just make up excuses to pop em like balloons. The great nerfed code blog. Wow tell us where the words hurt you. 100% into the culture of the Code, even using our phrases and memes. Don't let our memes be dreams. Join us Kip. You know you want to. hahahahaha kalorned/saltyclone/fighterjets aka tweeps/ still salty they got the boot from code. inb4 your replies I wont even read. They do seem pretty upset these days! James and crew are the master trolls! All these Pandemic Horde anti gankers with their bad genetics return here daily, like trained primates, to cry and rage. And whine about an old German political party from the last century. WTF are you guys feeding those miners? I get a good laugh at the comments too. These antigankers are so rage-filled and impotent it makes you wonder how they act in RL. Why your code get ragey over people bringing content to this site? Can't fix stupid it seems. Everyday I violate CODE laws and you shitbags can't do nothing about it! GIT GUD scrubs! You sound like a butthurt miner that has been ganked a few times. Proof or gtfo, lying carebear scum. Don't be afraid. Something about you reminds me of a guy called foxbolt. Apparently he was some sort of admiral or something, a real "miner", if you know what I mean. Yeah.. you sure showed us. Oh wait, all you did was whine anonymously on our blog and bring up the visit counter. If you have children, be sure their video games are appropriate for their age. Therefore, you must verify age restrictions and the content warnings for the game and decide if your child should buy it. Violence is prevalent in a lot of games, so try to steer clear of this.